The SoundTouch 30 will deliver punchy audio to any sized room, whether it plays a role in a larger speaker network or it is used as a primary sound system. The ability to pair multiple systems together makes the SoundTouch a worthy adversary to Sonos’ range of networked speakers. The inclusion of Bluetooth, additional online services and the ability to plug a hard drive directly into the SoundTouch 30's USB port would’ve made it more versatile, and ultimately a more attractive proposition. Bose's SoundTouch speakers work over a home’s wireless network, either independently or as part as a network of modular speakers. The idea behind modular sound systems is you can fill each room with its own speaker and still play the same song over them wirelessly, or play different songs across predetermined speaker zones. 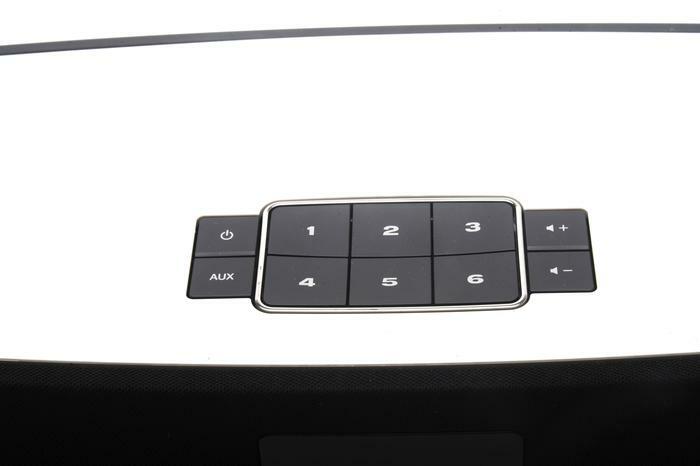 Populating Bose’s modular line up are three speakers: the SoundTouch 10, SoundTouch 20 and SoundTouch 30. All three speakers share an understated design marked only by eight buttons and a simplistic OLED display. 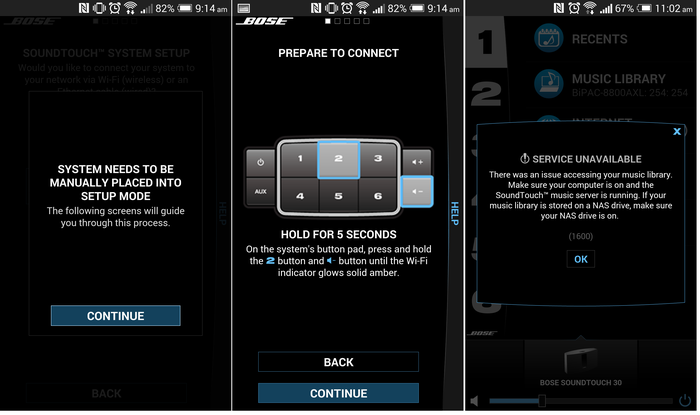 Bose’s free SoundTouch application is used to manage both music playback and the network of speakers. The application supports Android and Apple smartphones and tablets. 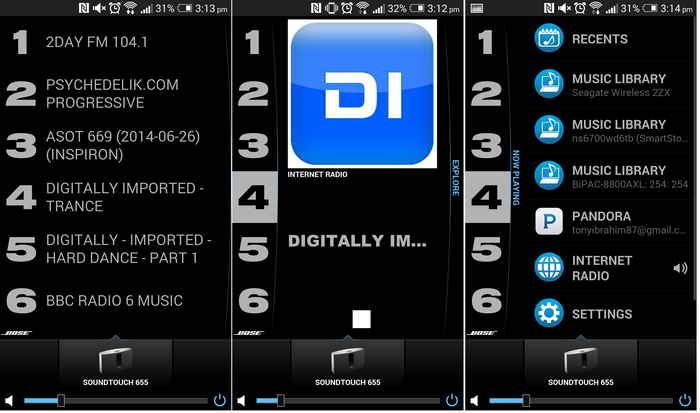 The app ties together different sources of music into one interface. The blue-on-black interface aggregates music from network attached storage (NAS) devices, global internet radio stations and the Pandora music discovery service. No matter the music source — whether it’s an internet radio station or an album stored on a network drive — it can be set as one of six presets. 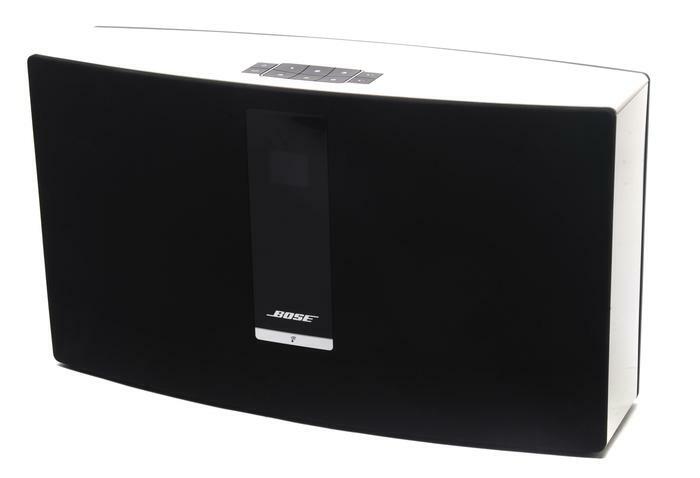 Bose has designed the SoundTouch to work over a home’s wireless network. The SoundTouch application eases setup by walking you through the process. Before the simple setup process is complete, the SoundTouch will check to see if a newer version of software is available; a process that takes no more than five minutes in all. Not every part of the setup was easy. We faced difficulties having the SoundTouch read a hard drive connected to our modem-router, even after we tried a different modem-router. Fortunately it was easier accessing our music library from a SmartStor NS6700 NAS drive. People locked into Apple’s ecosystem will find the Bose SoundTouch 30 easiest to use. Tracks stored on iPhones and iPads can be streamed wirelessly to the SoundTouch over AirPlay. Other mobile operating systems don’t benefit from the same support. Android and Windows users looking to play music stored on their devices will have to settle for music playback over the auxiliary port. Unfortunately, the SoundTouch doesn’t support Bluetooth. Good Gear Guide tested the SoudTouch 30 by playing some of our favourite songs in a closed room approximately 30 square-metres in size. Pressing play on Ferry Corsten’s Check It Out filled our test lab with what seemed like an ever-escalating amount of electronic notes, underlined by a steady melody of party-grade bass. Colleagues in adjacent offices sent through private messages asking “what’s the name of that track? It’s uplifting”, even though our SoundTouch 30 hadn’t passed the three quarter mark. Yet. Not that it would cause the system to slip up and distort. Even at the max mark, Bose’s SoundTouch 30 continued to play back music at bellowing volumes with clarity. Coldplay’s Every teardrop is a waterfall is played with the same enthusiasm, but the mid-range is wanting for more. Listening to such a tune highlights the SoundTouch’s narrow pitch as its music has one point of origin. A secondary SoundTouch would add a greater sense of dimension. The Bose system performed better when playing less cluttered rock ballads. Sweet Child O’ Mine by Guns N’ Roses sounded undeniably brilliant between the vocals and Slash’s jammin’ guitar. Mellow genres such as R&B fared well. Get Lucky by Daft Punk was played with deep, rounded and velvety bass. Plenty of space characterises the soundstage and, when playing tunes in the same vein of Get Lucky, a single SoundTouch 30 could easily fill a large room with lively audio. The SoundTouch 30 will deliver punchy audio to any sized room, whether it plays a role in a larger speaker network or it is used as a stand-alone speaker. Bose’s simple styling resonates for its good looks and focus on ease-of-use. The ability to pair multiple systems together makes the SoundTouch a worthy adversary to Sonos’ range of networked speakers. Having Wi-Fi on board does make it easy to stream music to the SoundTouch 30, but the speaker best caters to the needs of iPhone users. The inclusion of Bluetooth, more online services and the ability to plug a hard drive directly into the SoundTouch 30 would’ve made it more versatile, and ultimately a more attractive proposition. 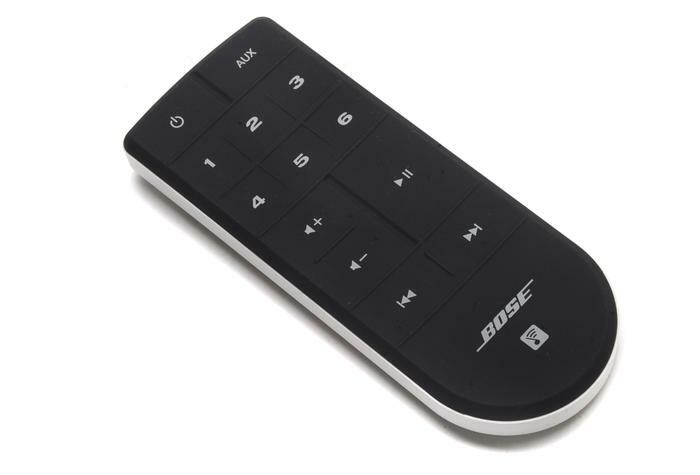 Bose is in the process of adding additional streaming services with iHeartRadio and Deezer expected to launch before the end of 2014.